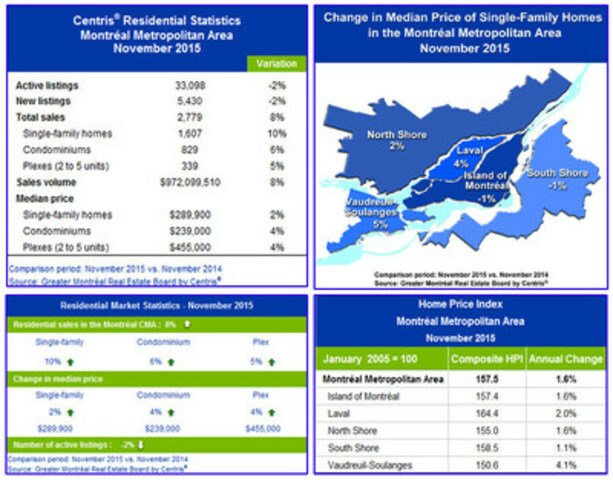 L'ÎLE-DES-SŒURS, QC, Dec. 4, 2015 /CNW Telbec/ - The Greater Montréal Real Estate Board (GMREB) has just released its most recent residential real estate market statistics for the Montréal Census Metropolitan Area (CMA), based on the real estate brokers' Centris® provincial database. In total, 2,779 residential sales were concluded in November 2015, an 8 per cent increase compared to November of last year. This was the ninth consecutive monthly increase in sales and the most active month of November in four years. Click here to watch the November 2015 statistics video. "After eleven months, cumulative results for the year show a 6 per cent increase in sales compared to the first eleven months of last year," said Daniel Dagenais, President of the GMREB Board of Directors. "This means that, in 2015, we are on track to register the first annual increase in sales in five years on Montréal's residential real estate market," he added. The North Shore registered a significant increase in sales in November 2015, jumping by 19 per cent compared to November of last year. This follows a 14 per cent sales increase in October. All of the other geographic areas also registered increases in sales in November: 7 per cent on the Island of Montréal, 5 per cent in Laval, 3 per cent in Vaudreuil-Soulanges and 1 per cent on the South Shore. Single-family home sales were very active in November with 1,607 transactions across the Montréal CMA, a 10 per cent increase compared to November of last year. Condominium sales increased for a fourth consecutive month, growing by 6 per cent compared to November 2014. After falling by 3 per cent in October, plex (2 to 5 dwellings) sales rebounded in November, increasing by 5 per cent. For the Montréal CMA as a whole, the median price of single-family homes reached $289,900, a 2 per cent increase compared to November 2014. Price increases were more sustained for condominiums and plexes. The median price of both these property categories grew by 4 per cent to reach $239,000 and $455,000, respectively. For a second consecutive month, the number of properties for sale on the real estate brokers' Centris® system fell by 2 per cent in November. In October, the decrease put an end to the upward trend in supply that had existed for more than five years. The Greater Montréal Real Estate Board is a non-profit organization with close to 9,300 members: real estate brokers. Its mission is to actively promote and protect its members' professional and business interests in order for them to successfully meet their business objectives. For November 2015 statistics charts, click here.